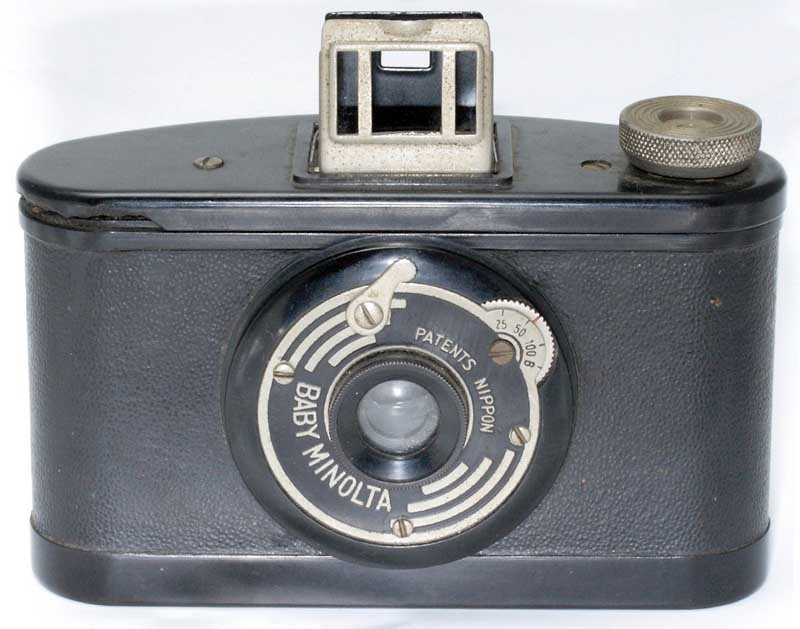 The Baby Minolta (ベビー・ミノルタ) is a Japanese camera taking 4×6.5cm pictures on 127 film, made by Molta then Chiyoda (later Minolta) from late 1935 or early 1936. The Minolta Vest 4×6.5cm bakelite camera released in 1934 soon became a commercial success, competing with the Pearlette by Konishiroku. The Baby Minolta was released as a less expensive alternative for beginners. Postwar historical accounts by the Minolta company (or its predecessor Chiyoda Kōgaku Seikō) say that it was introduced in 1935, sometimes specifying November, and this is repeated in many later sources; however the earliest known documents mentioning the camera are dated April 1936. The success of the bakelite models was such that the Molta company opened a dedicated factory at Amagasaki (尼崎) in 1936 (initially as the subsidiary Nihon Kōgaku Kikai Kenkyūjo, later merged into the main company), and that the more expensive 6×6 Minolta Six was released some months later. The Baby Minolta was imitated in 1937 by the 4×5 Sakura bakelite camera by Konishiroku. It is said that about 2,000 examples of the Baby Minolta were produced per month. The total production reportedly attained 50,000 units, more than the Minolta Vest (30,000 units), but these two figures might be swapped. In any case, the Baby Minolta was a large commercial success, and the bakelite Minolta models were among the most popular Japanese cameras made before 1945, perhaps only outnumbered by the Pearlette. Bakelite tube collapsed and extended. The Baby Minolta is a simpler camera than the Minolta Vest released earlier. It has a bakelite body covered with leather or leatherette and a bakelite telescopic tube supporting the lens and shutter assembly. There is a folding frame finder in the middle of the top plate, indicating the field of view for both 4×6.5 and 3×4 formats. The advance knob is at the left end of the top plate and film advance is controlled via two uncovered red windows in the back. Bottom lock with MTS logo and camera in the open position. The film plane is curved to compensate some of the lens aberrations. To load the film, the top plate is removed together with the spool holders and exposure chamber. It is locked into place by a lever placed at the bottom. The bakelite is recessed around this lever and the words OPEN and CLOSE are moulded, together with the MTS logo and the inscriptions TRADE MARK and MADE IN JAPAN. The shutter gives 25, 50, 100, B speeds set on a dial at the top. It is everset and the release lever is attached to the shutter plate. Leaflet for the Baby Minolta dating c.1936, showing the first variant. The retouched pictures give the wrong impression that there is a glass in the viewfinder. Baby Minolta, first variant. Extract from a leaflet dating c.1936. The first variant has small indexes in the finder to indicate the field of view for 3×4cm exposures. There is a metal advance knob with a low profile and either a flat top or concentric rings. The shutter plate is marked PATENTS PENDING at the top and BABY MINOLTA at the bottom. It has the MTS logo of the Molta company on the right and a chain of small circles drawing a decorative pattern on the contour. The camera was first featured in the new products column of the April 1936 issue of Asahi Camera. Pictures of the first variant appear in advertisements or catalogues dated 1936 to 1938, The price was ¥9.50 in 1937 (case ¥2 extra) and ¥11 in 1938. Outdated illustrations showing the first variant were used as late as January 1940, whereas the fourth variant was already introduced in 1939. The second variant has two bars in the finder for 3×4 format. The metal advance knob has a higher profile and a recessed centre. The early examples have the same shutter plate as above; the PATENTS PENDING inscription was replaced at some time by PATENTS NIPPON, presumably after the corresponding patent was issued. The third variant has a new shutter plate design with three stripes on each side. It is marked PATENTS NIPPON at the top and BABY MINOLTA at the bottom, and it does not have the MTS logo. The fourth variant has a black bakelite advance knob instead of the metal knob. It appears in an advertisement dated December 1939, where it was offered for ¥12. At least one advertisement or leaflet in English language is known, showing the third or fourth variant; it is not clear if this was published for foreign residents in Japan or for export. The Baby Minolta appears in the official price list compiled in October 1940 and published in January 1941, where its price is set at ¥10. The camera is mentioned in the introduction of the October 1941 catalogue by Asanuma Shōkai, presenting the Minolta range and the lenses equipping the various models; however it does not appear in the main pages, and it was perhaps not available for sale any more. Early and late Baby Minolta case. Two types of cases are known. One has the MTS logo and probably corresponds to the first and second variants. The other is embossed Baby Minolta and probably corresponds to the third and fourth variants. The July 1938 catalogue by Asanuma Shōkai says that the camera was supplied with a close-up lens, allowing to take pictures from 0.5m to 1m; this device is not mentioned in the c.1936 leaflet reproduced above, and was perhaps introduced some months or years after the release of the camera. The same 1938 catalogue also mentions a hood with filter holder for ¥1.50. ↑ The official chronology "Hensen kamera ichiran-pyō", on p.295 of Shashin Kōgyō September 1958, says 1935 (document reproduced in this Flickr page by Rebollo_fr). The fifty-year history book Minolta 50-nen no ayumi, pp.5 and 65, says November 1935. ↑ The release year is given as 1935 in Francesch, p.252, Scheibel, p.21, Lewis, pp.52–3, McKeown, p.673, Sugiyama, item 4056, Awano, p.16 of Kurashikku Kamera Senka no.12, Eimukku 735 Minolta, pp.131 and 133. ↑ The earliest articles and advertisements listed in Kokusan kamera no rekishi, p.342, are dated April 1936. ↑ Awano, p.7 of Kurashikku Kamera Senka no.12. ↑ Monthly production: Tashima Gizō, interviewed by Saeki Kakugorō on p.78 of Kurashikku Kamera Senka no.12. He was in charge of the production of the Baby Minolta when he entered the company in 1938. ↑ Total production: Awano, pp.7 and 16 of Kurashikku Kamera Senka no.12, suggesting on p.16 that the two figures might be swapped. ↑ The October 1941 catalogue by Asanuma Shōkai gives the lens scheme, showing a cemented doublet. The word used in the advertisements is tangyoku (単玉), literally meaning "single lens" but used for cemented doublets as well: see the 1936 leaflet reproduced in this page and the August 1937 advertisement reproduced in Kokusan kamera no rekishi, p.97. ↑ Coronar 80/8: Francesch, p.252, and Eimukku 735 Minolta, p.133. McKeown, p.672, says Coronar Anastigmat and Scheibel, p.21, says Achromat-Coronar. ↑ Flat top: examples pictured in Francesch, p.252, and in Sugiyama, item 4056. Concentric rings: example pictured in this page. ↑ Kokusan kamera no rekishi, p.342. ↑ Leaflets Shashin ha mazu!! Bebī Minoruta kara and Danzen kesshutsu shita kokusan kamera, dating c.1936, reproduced in this page; advertisement in Asahi Camera April 1937, reproduced in Kokusan kamera no rekishi, p.98; advertisement in Sunday Mainichi, 9 May 1937, reproduced at Gochamaze; advertisement in Asahi Camera August 1937, reproduced in Kokusan kamera no rekishi, p.97; advertisement in Asahi Camera January 1938, reproduced in Tanimura, p.15 of Camera Collectors' News no.118. ↑ Advertisement in Shashin Shinpō January 1940, reproduced in Hagiya, p.10 of Kurashikku Kamera Senka no.12 (there might be a date mistake in the latter source). ↑ Early examples with PATENTS PENDING pictured in Scheibel, p.20, in Awano, p.16 of Kurashikku Kamera Senka no.12 and in Saeki, p.78 of the same magazine. ↑ Advertisement published in Shōgakusei no Kagaku, reproduced at Gochamaze. ↑ Document reproduced in Francesch, p.22. ↑ "Kokusan shashinki no kōtei kakaku", type 2, section 1. ↑ Catalogue by Asanuma Shōkai dated July 1938, p.1. ↑ Price list by Asanuma Shōkai dated July 1938, p.1. Asanuma Shōkai. Cameras — All other apparatus and materials — 1938. Catalogue dated July 1938, p.1, and corresponding price list, p.1. Documents partly reproduced in this Flickr album by Rebollo_fr. Asanuma Shōkai. Shashinki to zairyō (写真機と材料, Cameras and supplies). Catalogue dated October 1941, p.7. Document partly reproduced in this Flickr album by Rebollo_fr. "Kokusan shashinki no kōtei kakaku" (国産写真機の公定価格, Set prices of the Japanese cameras), listing Japanese camera production as of October 25, 1940 and setting the retail prices from December 10, 1940. Published in Asahi Camera January 1941 and reproduced in Shōwa 10—40nen kōkoku ni miru kokusan kamera no rekishi (昭和10〜40年広告にみる国産カメラの歴史, Japanese camera history as seen in advertisements, 1935—1965). Tokyo: Asahi Shinbunsha, 1994. ISBN 4-02-330312-7. Pp.108—9. Type 2, section 1. Leaflet for the Baby Minolta, dating c.1935–6, by Asanuma Shōkai. Shashin ha mazu!! Bebī Minoruta kara (写真はまづ! !ベビーミノルタから, Photography first!! From the Baby Minolta). Document owned by A. Apra and reproduced in this Flickr album by Rebollo_fr. Leaflet for the Minolta and Happy range, dating c.1936, certainly by Asanuma Shōkai. Danzen kesshutsu shita kokusan kamera (断然傑出した国産カメラ, Definitely excellent Japan-made cameras). Document owned by A. Apra and reproduced in this Flickr album by Rebollo_fr. Minolta Camera. Minolta 50-nen no ayumi (Minolta・50年のあゆみ, Minolta 50-year history). November 1978. Pp.5 and 65. Awano Mikio (粟野幹男). "Minoruta ryakushi" (ミノルタ略史, Minolta short history). Kamera Rebyū: Kurashikku Kamera Senka (カメラレビュー クラシックカメラ専科) / Camera Review: All about Historical Cameras no.12, October 1988. No ISBN number. Minoruta kamera no subete (ミノルタカメラのすべて, special issue on Minolta). Pp.6–8. Awano Mikio (粟野幹男). "Senzen no Minoruta kamera" (戦前のミノルタカメラ, Prewar Minolta cameras). Kamera Rebyū: Kurashikku Kamera Senka (カメラレビュー クラシックカメラ専科) / Camera Review: All about Historical Cameras no.12, October 1988. No ISBN number. Minoruta kamera no subete (ミノルタカメラのすべて, special issue on Minolta). Pp.13–7. Eimukku 735, Manyuaru Kamera Shirīzu 15 (エイムック735・マニュアルカメラシリーズ15). Minolta: Minoruta kamera no subete (Minolta:ミノルタカメラのすべて, Minolta: all of Minolta cameras). Tokyo: Ei Shuppansha, 2003. ISBN 4-87099-923-4. "Jabara-shiki kamera no kiseki" (蛇腹式カメラの軌跡", Evolution of folding cameras). Pp.131 and 133. Shows a very small picture with a brief caption. Francesch, Dominique and Jean-Paul. Histoire de l'appareil photographique Minolta de 1929 à 1985. Paris: Dessain et Tolra, 1985. ISBN 2-249-27685-4. Pp.23 and 252. Hagiya Takeshi (萩谷剛). "Kōkoku ni miru Minolta kamera no rekishi" (広告に見るミノルタカメラの歴史, Minolta camera history seen through the advertisements). Kamera Rebyū: Kurashikku Kamera Senka (カメラレビュー クラシックカメラ専科) / Camera Review: All about Historical Cameras no.12, October 1988. No ISBN number. Minoruta kamera no subete (ミノルタカメラのすべて, special issue on Minolta). Pp.9–12. Lewis, Gordon, ed. The History of the Japanese Camera. Rochester, N.Y.: George Eastman House, International Museum of Photography & Film, 1991. ISBN 0-935398-17-1 (paper), ISBN 0-935398-16-3 (hard). Pp.52–3 (brief mention only). McKeown, James M. and Joan C. McKeown's Price Guide to Antique and Classic Cameras, 12th Edition, 2005-2006. USA, Centennial Photo Service, 2004. ISBN 0-931838-40-1 (hardcover). ISBN 0-931838-41-X (softcover). P.673. Saeki Kakugorō (佐伯恪五郎). "Tashima Gizō-shi ni kiku" (田嶋義三氏に聞く, Asking Tashima Gizō). Kamera Rebyū: Kurashikku Kamera Senka (カメラレビュー クラシックカメラ専科) / Camera Review: All about Historical Cameras no.12, October 1988. No ISBN number. Minoruta kamera no subete (ミノルタカメラのすべて, special issue on Minolta). Pp.76–9. Scheibel, Anni Rita and Joseph. 70 Jahre Minolta Kameratechnik — Von der Nifcalette bis zur Dynax 9. Stuttgart: Lindemanns Verlag, 3rd edition, 1999. ISBN 3-89506-191-3. Pp.20–1. Sugiyama, Kōichi (杉山浩一); Naoi, Hiroaki (直井浩明); Bullock, John R. The Collector's Guide to Japanese Cameras. 国産カメラ図鑑 (Kokusan kamera zukan). Tokyo: Asahi Sonorama, 1985. ISBN 4-257-03187-5. Item 4056. Tanimura, Yoshihiko (谷村吉彦). "Semi Minoruta I-gata to II-gata (sono 2)" (セミミノルタⅠ型とⅡ型[その2], Semi Minolta I and II [part 2]). In Camera Collectors' News no.118 (April 1987). P.15: reproduction of an advertisement for the Minolta range published in Asahi Camera January 1938. Zaisu Ikon (座椅子遺恨, probably a pseudonym of Y. Saji). "Besuto sanka (B-1)" (ベスト讃歌[B-1], Vest hymn [B-1]). In Camera Collectors' News no.57 (March 1982). Nishinomiya: Camera Collectors News-sha. P.6.